WHAT IS THE 2025 LEADERS PROGRAMME? 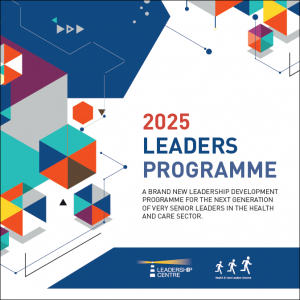 The 2025 Leaders Programme was launched by the Leadership Centre in early 2016, with the ambition to equip participants with the leadership capabilities to meet the challenges that will the health and care systems will face in the future. Just as today’s senior leaders are charged with the creation and implementation of the Five Year Forward View, the Chief Executives and Director Generals of 2020 will be charged with the creation and implementation of the roadmap to 2025 in the context of an increasingly complex set of demands and dynamics. By 2020, we may have resolved some of the structural and financial issues that face us today, but new issues will no doubt have emerged from the changing demographics and political pressures already on the horizon – mass migration, progress in AI and robotics, a changing global financial scene. To solve the ‘wicked problems’ faced by the sector, leaders are increasingly being asked to work at the system rather than the organisational level, tackling situations and issues that are irreducibly complex rather than just technically complicated. The programme is for those individuals working in the Department of Health or an Arms Length body, who see their next position as being a Director General or Chief Executive by 2020. You can find out more about the 2025 Leaders Programme by taking a look at the programme flyer below. The first cohort of the 2025 Leaders Programme is made up of 19 individuals representing 10 organisations. They first met for a 24 hr design event in early 2016, giving them the chance to get to know each other as well as co-crafting the programme to match their individual, organisational and wider system goals and priorities. This has since been followed by a three day event in June, looking at some of the major challenges faced by the Department and its Arms length bodies, including the politics of healthcare, how to lead systems change across Whitehall and locally, as well as how to enter effective partnerships across the NHS. Along with a range of high profile organisational speakers, the participants also heard from teams who’ve been involved in the work of the Health and Social Care Integration Pioneers, Local Vision pilots and New Care Model Vanguard sites from Southend, Brent, Adur & Worthing and Coventry. • A visit to a ‘Living Lab’ Test apartment – where developers and citizens can test out new technological solutions to help the elderly citizens in Copenhagen to live more independently. If the solutions are deemed fit for purpose they can then be rolled out on a wider scale. • Exploring the design principles for the largest Emergency Department in Denmark, where all emergency units are gathered in one specially designed building, made to offer the patients an integrated approach, where different specialties are working closely together and using the newest technology. This first cohort is due to formally end in March 2017. Given the success of the programme so far, supporting participants to access perspectives on a range of issues and the increased collaborative working across the participating organisations, we hope the programme can continue to develop and meet the emerging needs of our future senior leaders.